Your private Seattle tour will be led by a friendly, experienced local guide, who will meet you at your hotel. You'll then be chauffeured to the Space Needle, the Pike Place Market, historic Pioneer Square, and more. You'll see Amazon's corporate headquarters and drive by its iconic spheres, a new icon in Seattle. In Pioneer Square, you'll see UPS original location -now a Waterfall Garden Park- and see glass blowing in action (excluding Sunday) at a local glass studio. If you're a chocolate fan, you'll visit a shop in quaint Pioneer Square for some samples of their delectable infused chocolates. If you've already been to any of the destinations on this tour, we welcome your input in order to customize a special day for you. Add in Chihuly Garden and Glass (admission fee extra), the Hiram Chittenden Locks and Fish Ladder, Carl S English botanical gardens, or Alki Point beach with it's fantastic water view of downtown Seattle. Lunch is included at one of the fine restaurants on the Seattle Waterfront. You'll find our style and knowledge engaging, with history, heritage, geology, and current trends shared throughout the tour. We love Seattle. Get two tours in one on this Seattle and Snoqualmie Falls tour. We pick you up at your Seattle/Bellevue hotel and take you to all the fun places we love. The Space Needle, Pike Place Market, and historic Pioneer Square. You'll get the inside scoop on what's happening with our growth, population, and weather, along with some history and geology of the area. You'll also get the wonderful experience to see Snoqualmie Falls. It's worth the 45 minute drive with it's 268' fall. See wild animals in their natural habitat. NW Trek is a 725-acre forested park full of native Northwest animals. Elk, moose, deer, bison, caribou, goats, geese, swans, and more. We drive you in our quality comfortable SUV from Seattle/Bellevue/SeaTac to the park, and stay with you as you explore the park. It's a wonderful day visiting this wonderland of wild animals from a safe distance inside the tram. Other animals such as bears, cougars, wolves, raccoons, fishers, and otter live in the more defined area, where the other animals are in their natural environment and safe, as are we, but we can see them and enjoy. There's a cafeteria for lunch on your own. Seattle is Famous for its Glass Making. This may be your Once-in-a-lifetime to try your hand at Glass Blowing. A step-by-step process with skilled and kind instructors. You'll meet the Masters and create your own personal Molten Glass Paperweight sculpture or Glass-blown Globe - which will be shipped to you after it anneals (cures). What a Great Keepsake of Seattle! 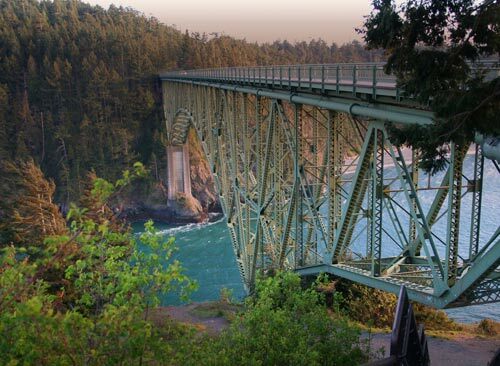 We begin with a drive to the North end of Whidbey Island where you’ll have the opportunity to walk across the Deception Pass Bridge. Many ships and vessels have been torn to shreds attempting to enter Puget Sound through this Passage. The tumultuous waterway below looked deceptively like a bay at first glance in 1792, and is why it got its name, compliments of Captain George Vancouver. We make a stop at Washington’s favorite State Park, pay a visit to historic Coupeville and Penn Cove, and then stop for a stroll with time for lunch in Langley. No island trip is complete without a ferry, which we’ll need to get off the island! This close to the MOUNTAIN... is Spectacular! Nothing prepares you for the immense size of Mount Rainier, 14,410 feet tall (4392 meters) We travel through local small towns and enjoy lush green foothills and meadows on our way to Crystal Mountain Ski Resort in the Cascade Mountains. Once there, you'll be whisked up the Gondola , a 4-6 passenger enclosed tram, to see magnificent views of Mount Rainier, Mount Adams, and deep valleys below. Lunch and dinner are available in the Summit House Restaurant. Soak in views from a sling-back chair on the ridge, or take a trail hike along the crest on many miles of trails. Interpretive Ranger Walks offered on select days; learn about local History, Geology, Wildlife and more. Super fun and very Northwest! Includes Lunch and Gondola Fee. The Bloedel Reserve on Bainbridge Island is an internationally renowned public garden and forest preserve. Its 150 acres are a unique blend of natural woodlands and beautifully landscaped gardens. Included are: a Japanese Garden, Moss Garden, Reflection Pool, and the Bloedels' former estate home. Prepare for walking activity and enjoy the included lunch in Bainbridge, a small, quaint, artistic Seaside village community. Washington has over 25 light houses, built to help ships along our ocean shores and the inland sea navigate during inclement weather and avoid crashing into shore. This tour focuses on the Eastern shore of Puget Sound, you’ll see our Mukilteo Iighthouse, Alki Point, and West Point lighthouses.To see more lighthouses, please call. Consider our Triangle of Forts Tour, with 3 more lighthouses. Discounts available for groups of 4 or more! Go to one of the oldest towns in the Puget Sound region, historic Snohomish, which was founded in 1859, before Seattle. Wander down these historic streets to visit a number of antique shops. We drive through the historic district and view the beautiful homes on the National Register of Historic Places. Surprising finds and maybe stop for lunch or ice-cream! Towns are within 1 hour drive. The Puget Sound Region has some very interesting small towns and is a great way to explore the region's history and heritage. A real inside look at the Pacific Northwest. A rustic, Victorian lumber town from our early days, the old mill is still here and the tiny town is wonderful as a step back in time. This town re-enacts Civil War battles and hosts both Union and Confederate camps in June each year. A harbor town on a river, this very quaint town is great to stroll and explore. The town boasts a wonderful heritage museum with an impressive Swinomish Indian Tribe collection and presence, and a quilt museum occupied in an historical Victorian home. This town is a favorite stop during the Tulip Festival in April. Coupeville, Poulsbo, Bremerton, Snohomish Edmonds, and Port Townsend, are a few more worth exploring. A Bavarian wonderland, this former railroad town transformed itself into a beautiful mountainous Bavaria after the railroad moved. It is amazing at Maifest with the May pole dances, during Oktoberfest in October, and during the Holiday Lights in December when they light up the entire town. Any time: winter, summer — with or without festivals — is a good time to see Leavenworth. Scenery, good food, unusual shops and great people. A small town on the ocean, Long Beach has many good restaurants and fun shopping for tee-shirts, kites, and assorted beach type items. At the sand dunes separating the town from the beach, you'll find dune grass, 31 miles or so of sandy beach and driftwood. Find seashells, rocks, and driftwood as you wander along the shoreline, listening to the pounding surf of the Pacific Ocean. Stop at the North Head Lighthouse and explore the trail to the cliff, see seagulls, maybe sea lions and/or harbor seals. Lunch is included at a restaurant you'll help pick, once we arrive in Long Beach. This tour takes us to Olympia, Washington’s State Capitol. The Capitol campus was designed by Walter Winder & Harry White, whose designs were influenced by the Olmsted brothers. The Legislative building was completed in 1928 and houses the chambers of the Washington State Legislature and offices of several elected officials. The Rotunda is worth the visit alone — you’ll see the largest Tiffany chandelier in the world. The tour itself is conducted by staff from the Legislative building and lasts one hour.